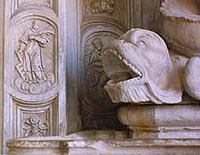 In 1306 thanks to Tommaso Sanseverino donation, the works for the "San Lorenzo" Carthusian Monastery realisation, which lasted five years, began. Yesterday it was centre of spiritual life, today it is a monument of a remarkable artistic value, a vital centre of culture. All the structural and artistic monument part has been realised using "the white Padula stone", particulary suitable for all type of working: such as colonnades, portals, fountains, facades and banisters. Hundred of local stonecutters, with their manual dexerity, enriched and embellished this splendid museum, leaving a rooted tradition in stone working to the future generation. Our restoration interventions on stony material take into consideration methods and materials recognized and practised by technicians of various Superintendences. Past civilizations have leaved their traces in the beauty of monuments, consequently in our daily life places and in our historical centres. These monuments help us to understand our past history and they have to be recovered to the fruition of everyone. 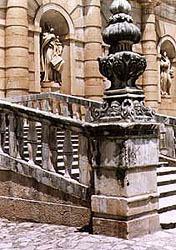 On this solid base of professional nature and tradition, Cancellaro company informs public and privat operators that it is possible to contact their customers service by e-mail or using an on-line form for all sorts of advice in intervention of recovery, polishing and restoration of stony handworks such as fountains, monuments, portals, statues etc. Our intervention methods in restoring stony materials provides only the use of substances and technics recognized and authorized by the Superintendences to the B.A.A.S.